KAMPALA. The blood donation drive at Forum for Democratic Change (FDC) headquarters in Najjanankumbi on Wednesday aborted after senior security officials blocked it, PML Daily has learnt. Officials of the Uganda Blood Transfusion Services (UBTS) failed to turn up for the blood donation exercise despite senior FDC officials claiming that UBTS staff had promised to attend. And now a senior security source has revealed that senior security officials ordered UBTS staff not to collect the blood from the party. This website has learnt that FDC and UBTS officials had held several meetings, agreeing on the method of collecting the blood, with the latest meeting held on Tuesday afternoon. However, the source adds that when senior security officials from State House got wind of the matter, they directed UBTS officials to cancel the exercise and directed police to deploy. The UBTS Executive Director, Dr Dorothy Kyeyune and the Public Relations Officer, Mr Michael Mukundane, refused to comment on the allegations. Whereas the exercise was set to start in the morning, no officials turned up and after waiting for hours, organizers started calling Blood Bank officials who reportedly kept saying they are coming until they didn’t show up. And indeed, a police vehicle with armed officers was deployed at the FDC offices for the whole of Wednesday. 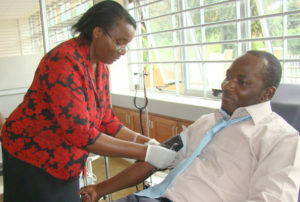 However, Kampala Metropolitan Police spokesperson Luke Owoyesigyire denies blocking anyone from donating blood. The information was collaborated by Ronald Muhinda, an aide of Kizza Besigye, who accused police of conspiring with (UBTS) conspire to block the blood donation exercise. “Officials at Blood Bank intimated that state House officials had issued orders that they will not entertain “that nonsense of FDC donating blood” to Uganda,” Mr Muhinda said. Mr Waswa Biriggwa, the FDC Chairman, accused UBTS of playing cheap politics and being insensitive to suffering Ugandans. “It is unfortunate that many people are dying due to lack of blood and UBTS is here playing cheap politics. You can’t politicize such a thing. This brings our country to the gutters,” Mr Biriggwa said. Mr Patrick Oboi Amuriat, the FDC President, vowed to mobilise all party supporters countrywide to shun other blood donation drives. “It is this morning they informed us that they would not make it for two reasons; that they didn’t want to be perceived to have political interest and then that there was already enough blood in the cold room. We were responding to a public call for blood shortage in the country, we can see people die and yet there is something we can offer,” Mr Amuriat said. “They should have informed us because they have kept postponing the exercise since last year. We are calling upon the authorities to come out and explain this because we as a party are going to advise all the party members in the country not to give any blood,” he added. Uganda needs at least 340,000 units of safe blood annually, but usually only collects 200,000 a year. The Uganda Medical Association, an umbrella organisation of doctors in public health facilities, said the shortage is “almost [at] crisis level”, resulting in the cancellation of hospital operations and prioritisation of cases.